Home News Bollywood Movie News Parineeti singing the announcement of “Meri Pyaari Bindu”!!! Parineeti singing the announcement of “Meri Pyaari Bindu”!!! This sweet yet hot pataka was missing from the screens for more than a year. And finally she has finalised a script with Yash Raj Films. The film is going to be produced by Maneesh Sharma and will have a debut director Akshay Roy. Wait are we missing the obvious on the screen, that’s right Parineeti Chopra crooning a melody. All this while she captured everyone with her killer looks and acting, now she is singing. After Priyanka, Shraddha and Alia, Parineeti is on and she sounds like a meadow. She will be teaming up with Ayushmann Khurrana in “Meri Pyaari Bindu”. Yash Raj knows how to make an announcement and this one is impressive. Shubh Mangal Savdhan Movie Review: Shubh Mangal Saavdhan, a perfect comical satire on dysfunctional erectile! Bareilly Ki Barfi Movie Review: Bareilly Ki Barfi, is definitely a tasteful comedy at every crisp bite!!! 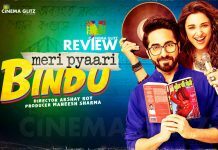 Meri Pyaari Bindu Movie Review: Meri Pyaari Bindu, is a quirkiest take on love and friendship!! !